Born at Hopton, the son of Philip Gell and Dorothy Milnes. The Gell family was one of the oldest families in England with a tradition of service in the Army, Navy, Parliament and the Church going back to 1209. His great grandfather was the parliamentarian Sir John Gell and his uncle was Admiral John Gell. Gell was educated at Derby School and Emmanuel College, Cambridge. He matriculated there in 1793, took a BA degree in 1798 and an MA in 1804. From 1804 to 1806 he travelled in Greece. In 1807 he was elected a Member of the Society of Dilettanti and a Fellow of the Royal Society. In 1811he was commissioned to explore Greece and Asia Minor. These travels resulted in several publications, e.g. Geography and Antiquities of Ithaca and Itinerary of Greece, with a Commentary on Pausanias and Strabo. With these publications he achieved fame. He went with Princess Caroline to Italy in 1814 as one of her chamberlains. He gave evidence in her favour at her trial before the House of Lords, stating that he had left her service merely on account of a fit of the gout and had seen no impropriety between Caroloine and her courtier, Bergami. Though, in letters, written under such pseudonyms, Gell related bits of scandal about the Queen. He was Knighted in 1814. Gell was a close friend of Keppel Richard Craven and travelled around Italy with him. From 1820 until his death, he resided in Italy. He painted. He received visitors including Sir William Drummond, the Hon. Keppel Craven, John Auldjo, Lady Blessington and Sir Walter Scott. Crippled by gout, Sir William took Scott to Pompeii and showed him around the excavations. After Scott’s death, Sir William wrote an account of their conversations in Naples. He published some of his best known archaeological work including Pompeiana and The Topography of Troy. 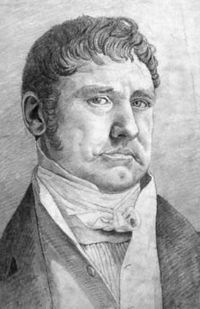 Gell died at Naples in 1836. He left all his personal belongings to Craven. The Itinerary of Greece, with a commentary on Pausanias and Strabo, and an account of the Monuments of Antiquity at present existing in that country, compiled in the years 1801, 2, 5, 6 etc.. London, 1810. Pompeiana. The Topography of Edifices and Ornaments of Pompeii. 2 vols. London, 1817-8. The Topography of Rome and its Vicinity with Map”. 2 vols. London, 1834.